Exhausted foal carried limp back to the trap by wrangler. Later the foal had to be carried off the trailer. (Reno, NV) Federal Judge Miranda Du issued an emergency restraining order in a legal action filed in Reno Federal District Court against conduct at the Bureau of Land Management (BLM) wild horse roundup operation in northern Nevada. The order states: Defendants shall immediately cease cease and halt all wild horse gathers at the Owyhee Complex, including the one currently ongoing at the Owyhee HMA, and the BLM shall not transport horses from the Owyhee HMA, until the court has had an opportunity to hear this matter. 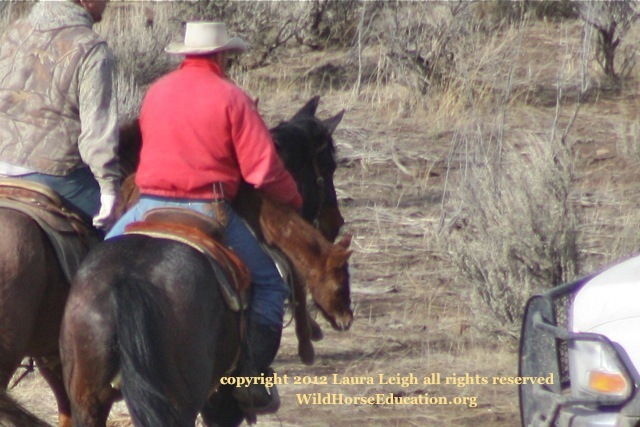 The case was filed on behalf of Laura Leigh, founder of Wild Horse Education, by attorney Gordon Cowan of Reno. Over the course of the last two years BLM has been making claims that a policy will be in place or creating operation “memorandums” that are ignored in practice. After a Restraining Order gained by WHE documentation in August of 2011, after a pilot apparently hit a horse with the helicopter skids, BLM did an internal revue that revealed a host of inappropriate conduct. That case is still active in Federal Court with hearings expected early this year. At the Owyhee Complex roundup operation that began on November 26, Leigh continued to witness offensive conduct. 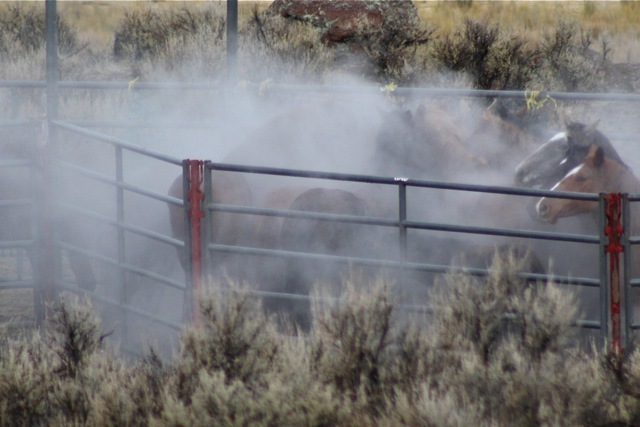 In court documents Leigh states that inappropriate conduct was observed repeatedly including: routine use of electric cattle prods, wild horses driven through barbed wire, operations in sub-freezing temperatures. In one instance wild horses were documented being driven into a barbed wire fence and four animals became entangled, two literally crashing onto their heads. These cases, investigations and supporting documentation, are supported solely by Wild Horse Education, a registered Nevada non-profit. With your help we can continue to be their voice!